Consciousness is the most interesting function brain has. It is the ability to experience those processes going on inside the brain. Different brain processes also represent themselves differently in consciousness (in other words, they have different qualia). The work done by those neurons that analyze visual input appear to us as colors and shapes. Neurons involved in auditory processing manifest themselves in sound. A lot of brain activity occurs without any consciousness. Even creative thinking – we are only aware of that “Aha!” moment, when the right solution suddenly pops into mind, but not conscious of all the hard work behind. But consciousness is what makes life interesting in the end. New technologies can make it even more interesting by improving and expanding this conscious experience. Can we make such neural implant that would represent its activity in consciousness, similarly to neurons? Such implant will create its own qualia, additionally to those we have. That means it will create some parts of consciousness artificially. It seems there are already brain prostheses available today that provide us with artificial perception, auditory (cochlear implants) or visual (retinal implants). But they do not enter conscious experience by themselves. They just work as a replacement for sensory organs – eyes or ears – giving brain correct visual or auditory information for input. The information is brought to consciousness later, when it is processed by neurons inside the brain. So it is still neurons, not the device, which enter consciousness. Our task is to make electronic chip access and modify consciousness directly. But is t possible to create consciousness or some of its parts artificialy? Why not: if these are some properties of our nervous system that create consciousness, we can reproduce them in an artifact. Such attempts are already being made. Researchers have built neural networks that have some properties of consciousness to test their theories. The most advanced and interesting from these developments are so-called “brain-based devices” – robots by Gerald Edelman. Another though question is integration of electronic consciousness with those created by the brain. A fact that should make the task a little easier is modular organization of brain itself. There are neuroanatomically different substrate for visual, auditory, olfactory and other senses. From those brain parts related to visual processing, there are separate areas for handling shape, color and motion. Lesion to “color module” will affect the ability to perceive colors only, the same with motion. Despite of working each with its own piece of information, these modules produce a unified, single conscious experience. So what knits them together? There are numerous attempts to explain how does activity in different brain parts gives rise to unified conscious experience. The most developed approaches – and those that address our integration problem – are provided by Tononi & Edelman (Information Integration Theory) and by Stanislas Dehaene (Global Neuronal Workspace). Tononi & Edeleman think that to produce consciousness different modules have to be integrated in such a way that activity in each separate module affects all others (but to some extent: modules still have to remain specialized, and their activity to differ). This is achieved with reentrant (reciprocal) connections between modules. What is especially interesting about this approach is that Tononi proposed a set of formulas for calculating degree of consciousness within given system. The latest revision uses integrated information measure – phi. Any system with sufficiently high “phi” is supposed to be conscious. Dehaene (Global Workspace Theory) also emphasizes importance of global broadcasting, but makes it easier by delegating this task to special subset of neurons with long-distance connections to other modules “cortical processors”. They form a “global workspace”. The module have to interact with the workspace via reciprocal connections in order to enter consciousness. But how to connect the implant in such a way that it will broadcast its activity to other brain modules? We need kind of interface that can provide communication with multiple various brain areas. 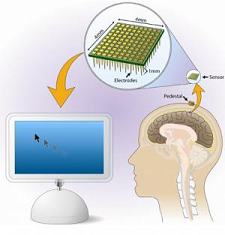 Electrode grids can only connect to those neurons that are close to the brain surface. But what if we need to access deep structures such as thalamus – which is thought to play an important role in consciousness – too? DBS electrodes can go deeper into the brain, but the area they connect to is very localized. To access different brain areas, we’d need to insert a huge amount of these sticks, which can damage the brain. The whole procedure is going to be very cumbersome if possible at all. These methods are used successfully for kind of brain implants we have today, but for our task we have to look for something else. Fortunately, there are some approaches that could be applied. One of them, developed by Llinas, would be to put electrodes into blood vessels. They transfuse the whole nervous system, so there won’t be a problem to access any brain structure. The electrodes are designed to automatically unwrap & penetrate through the vessel, that should make adding a lot o connections much less cumbersome. Another approach that comes to mind is to make the connection the way brain does: through neurons and their axons. Today it is possible to grow nerve cells directly on a chip. Such hybrid systems can even control simple robots. What if these nerve cells can be genetically engineered to pull their axons inside the brain, connecting neurons from Global Neural Workspace and other important for consciousness areas? What kind of applications conscious neural implants can have? The most practical would be natural control of prosthetic bodies. There are robotic limbs developed today that are connected to nervous system and can be controlled as any other part of the body. Conscious implants can be used to provide tactile and proprioceptive feedback about the limb. From scientific perspective, conscious implants provide a fresh approach to the problem of transferring information into the brain. The transfer happens when information contained inside the implant is made available to consciousness, or, in other words, when the implant and the brain transform from being two separate conscious agents to form a single conscious system. This conscious system has its own properties, that can be described (potentially) by a set of mathematical tools being developed (Tononi). These tools will allow us to calculate the optimal design for such system, including the design for implant itself and its connections with the brain. Can the same kind of neural interface be used to insert into our not a simple artificial quale, mind but the whole experience of another creature? Imagine we could connect our brain to the bird’s brain and experience flight. If consciousness depends on integration, however, our minds can turn out to be too different to be integrated and still preserve normal functioning. If we increase the scale, however, functional problem can disappear. Teilchard de Chardin‘s vision will come true. 5 Responses to "“Mind implants” or how to expand consciousness using new technologies"
This was a great presentation. There are still a lot of questions to be answered in BCI research. I think problem put up in slide # 16 “might be” solved by using synthesized nanomaterials directly put up on neurons to transmit signals. One another interesting fact observed was that, in some other research scientists showed that carbon nanotubes could even pass the blood brain barrier. hence using nanotechnology it might be possible to put “brain implants” directly through the blood stream instead of drilling a hole in the skull! 4 | Beyond the Borg (like Ghost in the Shell!) « Gleeful Spiritual Cove of Heavenly Booty! 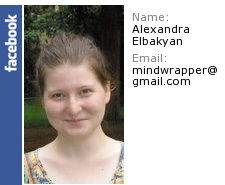 are which would be amplifying and carrying the neural information to something as common as EEG detection hardware. Pulses of EM could be used on occasion to possibly re-align or configure the substance. the EEG could pick up on.